The next mission for the South African under-20 football team is to reach the knockout stage of the 2019’s FIFA Under-20 World Cup in Poland. 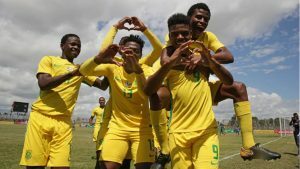 Amajita finished third and won bronze at the under-20 Africa Cup of Nations in Niger and they qualified for their second successive World Cup. Amajita is the most successful team in the history of South African football. The team will be participating in their fourth FIFA World Cup since readmission in 1992. Their first World Cup was under Shakes Mashaba in 1997 with the likes of Benni McCarthy and Quinton Fortune in the team. Serame Letsoaka did the same in 2009 playing with, amongst others, Ramahlwe Mphahlele and Andile Jali. Thabo Senong is now the highest achiever with back-to-back World Cup qualifications on his CV. Senong achieved this feat with a group of unknown youngsters who were promoted from the Under-17’s. He says the team’s biggest challenge in Dakar was scoring goals. The next mission now is to at least reach the knockout stage in Poland. Player Luke le Roux says they are very proud of their achievements, but realize that real work starts now. Amajita midfielder, Nkosingiphile Ngcobo, says that they work as a team. The post Amajita aim for Under-20 World Cup knockout stages appeared first on SABC News – Breaking news, special reports, world, business, sport coverage of all South African current events. Africa's news leader..